Council tax bills in England will increase by an average of 4.5% from April, reaching more than £1,800 in some regions, research suggests. It is the second highest rise in a decade, the Chartered Institute of Public Finance and Accountancy (Cipfa) said. The Local Government Association said cuts had left councils "little choice". The government said they were "responsible for managing their own resources." A survey of 312 councils by Cipfa found eight out of 10 will impose the maximum increase permitted. Cipfa said the annual Band D bill would rise by an average of £75.60. The increase varies from an average of £71 in London to £86 in the north-east. Funding for the police makes up about a third of the increase, with police and crime commissioners permitted to double their precept from £12 to £24. In 2018-19 bills increased by an average of 5.1%, the largest rise for 10 years. The effect of the referendum cap meant that bills fell in real terms between 2011 and 2015 because they did not increase in line with inflation. Gloucestershire County Council was one of the authorities to approve the full 4.99% increase. The council plans to pump more money into children's services and adult social care, the Local Democracy Reporting Service said. Lewisham in London, Birmingham City Council, North Yorkshire County Council and Kent County Council are among those where council tax will rise by 4.99%. Those not rising by the maximum include Cornwall (3.99%) and York, which voted for a 3.25% increase. Rob Whiteman, chief executive of Cipfa, said the increase was a reflection of the "incredible" financial pressures faced by local authorities and the police. "Local authorities have faced the most significant cuts to spending over the last ten years," Mr Whiteman said. "Despite the government's announcement that austerity is ending, for local authorities this is clearly not the case." Councillor Richard Watts from the Local Government Association said councils had lost "60p out of every £1" the government had provided for services since 2010. "Faced with such funding pressures, many councils feel they have little choice but to ask residents to pay more council tax again this year to help them try to protect their local services," he said. A spokesman for the Ministry of Housing, Communities and Local Government (MHCLG) said: "Councils, not central government, are responsible for managing their own resources. "Taxpayers can veto excessive increases via a local referendum." The local referendum rule only applies in England. 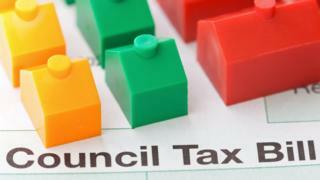 The National Assembly for Wales and the Scottish Parliament have the power to cap local authorities' council tax rises.